There are many ways to play this on the guitar, at least 50, probably more. On the piano, there’s only one place where each of those notes exist. It’s the thing that makes the guitar (and other similarly cursed instruments) a bit tricky; especially if you go about learning the guitar using shapes. It would be a mammoth task to learn all those 50 shapes for the A-7 arpeggio, and then all the other arpeggios, and then all the other keys, and then scales, and so on. It’s impossible to do that. But, I can do it. I can do it because I know the fretboard really well, and I know the sound and the name of the note I’m after. So I don’t have to learn patterns and shapes. I use these three bits of knowledge – the sound, the name, the fretboard location – to be able to fluidly move the material anywhere I want it. The advantage of this approach is that it frees you up to be able to concentrate on how you want to phrase something, how you want it to sound. You’re not limited to the shape you’ve learned, and therefore the limited phrasing possibilities (on the guitar) within a shape. 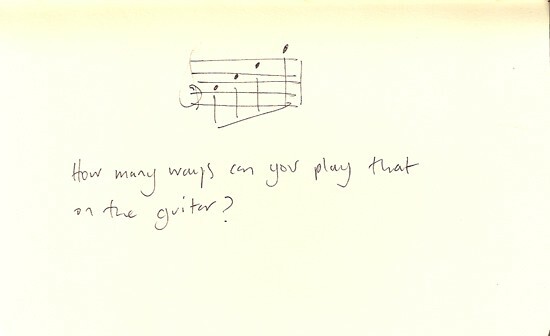 It makes you think in this order: ‘how do I want this to sound?’ and then, ‘so how am I going to play it?’. Rather than a clash between your intention and your reliance on a shape.